Who understands a woman's car question better than another woman? Judy Hansen has been in the automobile industry since 2004 and is top in her field. She is a teacher/trainer and a mother of four. She atrtributes her success to her commitment to excellent customer satusfaction. Judy brings laughter and inspiration to all who attend her seminars empowering YOU in making the right choices for YOU! Call your friends and let them KNOW!! Don't get me wrong. I don't have a problem with the premise, here. I actually sort of like the idea of teaching women more about cars and empowering them to feel more confident about buying one. I could just do without the condescending language, pink design, and the stereotypical imagery of laydeez gabbing on the phone. You're just mad that they pegged you so well. You know the moment you saw you, you were on the phone like, "OMG, Katie, you gotta check this out!" Well, I was on the phone all like, "KATIE, you HAVE to change your flight and come here a day earlier so that we can go to this. 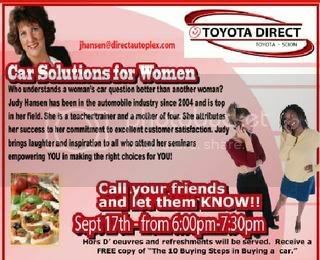 This woman wants to empower YOU to make choices for YOU!!" Actually, you should have decided to get here on Wednesday instead of Thursday, anyway, so we could watch Project Runway and ANTM together. Because if you think I can just DVR them and wait to watch them with you, you're WRONG. And Erin? Yes. You're a laydee. In every sense of the word.